Baltimore County police said Jacob William Rogge, 28, of Upper Falls, donned a pink-and-white unicorn costume and smashed a High's register with a crowbar early Saturday. BALDWIN, Md. (AP) — Police say they’ve captured an elusive unicorn, since unmasked as a man suspected of robbing a convenience store last week in Baldwin, Maryland. 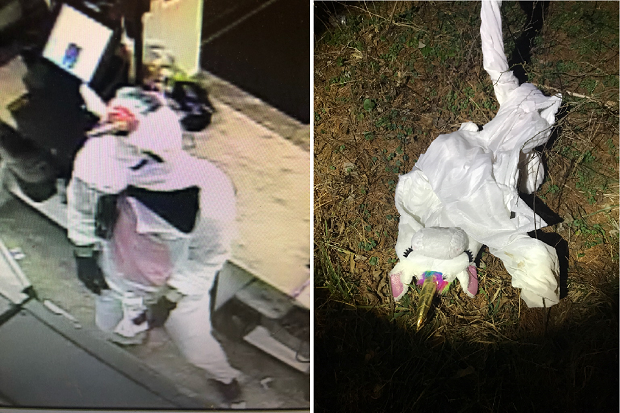 Baltimore County police said Jacob William Rogge, 28, of Upper Falls, donned a pink-and-white unicorn costume and smashed a High’s Dairy Store register with a crowbar early Saturday in the 13500 block of Long Green Pike. Police said 27-year-old Joseph Philip Svezzese drove Rogge, who fled with cash and cigarettes. The pair’s car crossed into oncoming traffic, crashed into mailboxes, a utility pole, shrubbery and a boulder, which sent the car back across the road until it hit a tree. Both men were hospitalized with serious injuries. Svezzese was treated and released, but Rogge remains hospitalized in serious condition. Court records didn’t list lawyers. Police said the unicorn costume was discarded and later found in bushes.